Kuusamo is a natural, active town in Finland’s region of Northern Ostrobothnia, just below the line of the Arctic Circle. Where better to have an activity holiday with your family? It has long been renowned for the phenomenal outdoor environment that surrounds: scattered lakes and endless fells, all covered in blanket upon blanket of snow, lasting from October to May. And it’s in this very place that you and the children can spend time on our marvellous Christmas holiday, far away from crowded and manufactured Santa experiences! The Holiday Club Kuusamon Tropiikki will open its arms to you for the duration of your stay. Situated to the north of Kuusamo, it overlooks the charming Lake Petäjälampi and offers large rooms and villas containing all amenities. Children will love the pool area and Angry Birds soft play; parents will definitely want to repose in the sauna complex and massage stations. You can look forward to tasty breakfasts and international cuisine buffets to fill you up in between! The Father Christmas holiday we’ve prepared at Kuusamo will transport you to a winter wonderland and whisk the family into a realm of reindeer and elves. 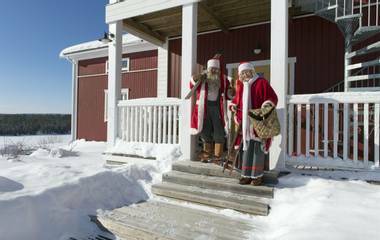 In the build up to meeting Santa, there will be a host of traditional Nordic activities to get you right in the festive mood. Husky riding is a much-loved means of getting around in Finland, and children very much enjoy making friends with their canine companions. With their paws pounding away and tails wagging happily, the huskies will take you on a splendid trip. Of course, you’ll also be able to meet reindeer – everyone’s favourite Christmas animals – who will pull your sleigh on a pretty route. There will be tobogganing and snowshoe treks – you can go hunting for Santa and enjoy seasonal cookies round a fire. When you do go to Santa’s house, you’ll be greeted by Mr and Mrs Claus and help them with baking and greeting card making. After lunch, you’ll learn a song or two from Father Christmas and race his elves on a frozen lake. What fun!! Christmas at Kuusamo with Activities Abroad is an enchanting getaway that has received first-class praise from previous holidaymakers. Part of the advantage is that we see experiences as the real gifts, not showy presents which give brief joy and then get left lying around the house. Toys grow old and get quickly abandoned, but memories can be replayed, and that is exactly the case with the ones you and your children will make on this trip! Several Christmases later, you’ll be reminiscing about that time when you baked spicy gingerbread cookies in Santa’s own house, or rocketed past a competitive elf on a sledge – not things which are easily forgotten. We would also like to point out just how much fun the animal activities can be. Children form an instant connection with huskies and reindeer, and it’s absolutely thrilling to watch how they get along. No doubt they’ll be asking for the sleigh to be pulled round again and again, because once just isn’t enough!